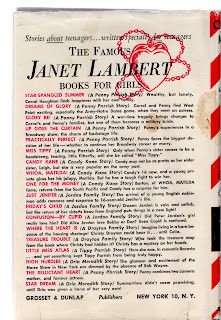 Janet Lambert predates the fifties teen romance novel by a few years; her first novel was published in 1941. With war as a dramatic background, her two main series focus on two sprawling army families (the Jordans and the Parrishes) who repeatedly and complicatedly intertwine through marriage. Janet Lambert, author of the delightful Penny Parrish and Candy Kane books and creator of Just Jenifer and other stories, was born and brought up in Crawfordsville, long known as the Athens of Indiana and a town still proud of the number of authors it produces. Long interested in both the theatre and in writing, Janet Lambert effected a happy compromise by early deciding to become an actress and to write her own plays. During her acting career, she achieved her dream of playing with Walker Whiteside and appeared on Broadway. Marriage to the boy from back home, Colonel Lambert--then a captain--put an end to her stage career. It was then that she turned again to writing, this time creating the stories for her daughter that would soon endear her to a much larger audience. The backgrounds of many of Mrs. Lambert's stories are the various Army posts across the country which she came to know so well as an Army wife. 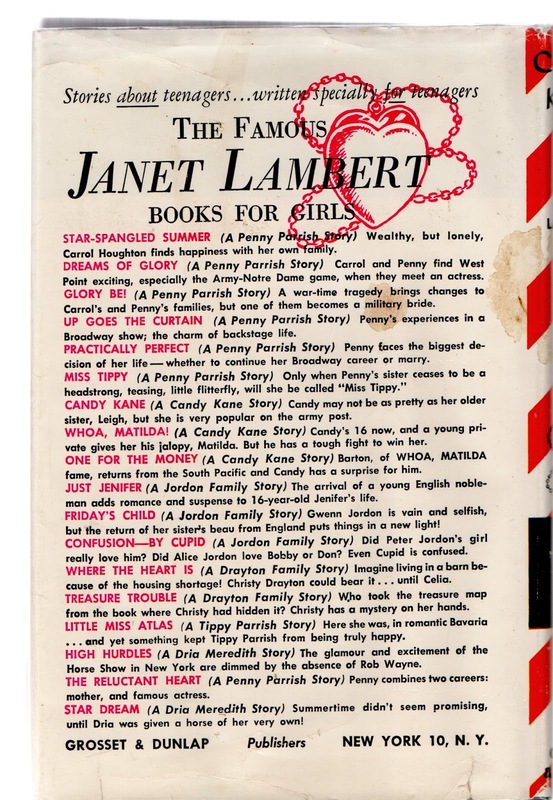 Janet Lambert's characters--from Candy and Jenifer to Penny and all the rest--are a captivating group, with the natural, irrepressible vitality of teen-agers, plus their usual complement of problems, surprises and romance. And it is a happy discovery to find that you can follow their lives from one entertaining book to the next. The Lamberts, now that Colonel Lambert has retired from the Army, live on an island off the coast of New Jersey. These just happen to be my favorite series by Janet Lambert. For a full listing of her books and series, check out Schoolgirl Shamus, Inc.